In the year since the launch of GW VALOR, GW continues to find creative ways to serve the veteran community. Verónica María Hoyer (left), Vice Admiral (retired) Mel Williams Jr., a guard, GW President Steven Knapp and Board of Trustees member Mark Shenkman finish laying a wreath at the Tomb of the Unknown Soilder in November. During her two tours in Afghanistan on board the MC-12W Liberty aircraft as a tactical systems operator, Verónica María Hoyer was the “eyes in the sky” for her fellow servicemen and women. In summer 2013, after more than four years in the military, Ms. Hoyer grounded herself in Washington, D.C., ready to begin her next mission: earning a degree at the George Washington University. As a high-achieving high school student, Ms. Hoyer had long envisioned attending college but knew her family could not afford to send her. Through support from GW’s Yellow Ribbon Program agreement with the U.S. Department of Veteran Affairs (VA), her undergraduate education would be fully funded, and she could fulfill her dream of studying international affairs. But once at GW, Ms. Hoyer found that she was older than most of her peers and sought to connect with students of a similar background. It was not until she joined GW Veterans—a student organization housed on the fourth floor of the Marvin Center—that Ms. Hoyer rediscovered the “brotherhood” that she had missed from her years serving. Now, as vice president of GW Vets, Ms. Hoyer wants to reach out to other student veterans who may be struggling to find their niche on campus. One year ago, on Armed Forces Day, Vice Admiral (retired) Mel Williams Jr., announced the launch of the GW Veterans Accelerate Learning Opportunities and Rewards program (GW VALOR). Under the leadership of Adm. Williams, GW’s first associate provost for military and veterans affairs, the interdisciplinary effort was created to unify and expand on a number of veterans initiatives, with the goal of making GW “the university of choice for veterans, military members and their families,” Adm. Williams said last May. There are more than 1,350 self-identified military members, veterans and their families enrolled at the university. Since the establishment of GW VALOR, the university has made an increased institutional commitment to expanding access and affordability for military members, veterans and their families. These efforts have included the expansion of the university’s presence at the GW Hampton Roads Center and support at military facilities, the School of Nursing’s Transition to Nursing program (B.S. in Nursing for military Medics and Independent Duty Corspmen), promoting existing graduate online degree programs, and the creation of undergraduate online degree programs, which were inspired to serve the educational needs of military, veterans and military family members. “The way that I would characterize the first year of VALOR is that many good things have happened as a result of the collaborative effort of GW faculty and staff toward maximizing the success of GW VALOR students,” Adm. Williams said. While learning is a core value of GW VALOR, service is also a key component of the initiative. There are a number of outlets—such as GW Vets—that exist at GW to help smooth the transition from combat to college by offering mentoring and wellness support services, streamlining tuition assistance processes and creating a sense of community for veterans on campus. The university recognizes that more than 2 million Americans have been deployed to Iraq and Afghanistan in the past decade, and now an overwhelming number of those soldiers are returning home and enrolling in universities using their Post-9/11 GI Bill benefits. In 2009, the Office of Military and Veteran Student Services was created to support that wave of incoming veterans. Now aligned with the GW VALOR effort, this office hosts events for students and works closely with GW’s Center for Career Services to provide top service for VALOR students, which supports their overall career transition, and assists with internship and job placement, as well as with networking opportunities. 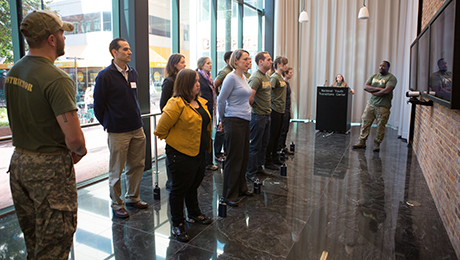 One initiative he developed this year was the Ribbon Project, an immersion-style training program designed to bridge the gap in communication between GW faculty and staff with military personnel and student veterans. During all-day training sessions, student veterans lead sessions for faculty and staff, giving them orders similar to those that they received in the military, and relaying personal accounts of the their time in uniform. The program simulates a service member’s life cycle and is meant to give members of the GW community a taste of military lifestyle. Mr. Ruybal said it is important for the university community to have a sense of veterans’ unique backgrounds and to understand how they could be a benefit in the classroom. The Ribbon Project is an immersion-style training program hosted by the GW Office of Military and Veteran Student Services. The program is designed to give faculty and staff a glimpse into military culture. This past December, GW became one of 96 colleges nationwide to participate in the VetSuccess On Campus program, which places a VA vocational rehabilitation counselor permanently on campus to assist veterans with their academic success and wellness. Roger Deason, GW’s first VetSuccess on-campus counselor, “bridges the gap” between veterans and the VA, said Mr. Ruybal. Mr. Deason assists both current and prospective students with information on VA educational benefits, transition support services, career counseling and job placement. “A lot of these processes can be difficult to navigate,” Mr. Deason said. Often, Mr. Deason said, the VetSuccess counselor is the “first step” for student veterans seeking help, as he can then refer them to the appropriate resources. This past spring, Mr. Ruybal also established a new peer-to-peer support program for veterans who might feel overwhelmed as they begin their undergraduate career. The Transition, Assistance, Guidance and Support (TAGS) program, which already has 132 participants in its first semester, links current and prospective veteran students with a peer mentor. The peer mentor acts as a guide to the new student, and then that student is assigned to a peer adviser. But even with the support of a strong veterans community on campus, the fact remains that veterans still suffer from various mental health illnesses. While only 1 percent of Americans have served during the wars in Iraq and Afghanistan, former service members represent 20 percent of suicides in the United States, according to a 2011 report by the Center for a New American Security. The VA estimates that 18 veterans die by suicide each day. Paul Tschudi, a professor in the School of Medicine and Health Sciences and the Graduate School of Education and Human Development, has provided mental health counseling for veterans for more than 25 years. Mr. Tschudi, who was a medic during the Vietnam War, said the most recent cohort of returning service members has a unique set of needs that must be properly addressed. And veterans are often reluctant to seek mental health services, having just come from an environment where they are required to be strong and not show weakness. “That spills over into civilian life,” Mr. Tschudi said. This past fall, Mr. Tschudi was notified that the Wendt Center for Loss and Healing received a grant to offer free counseling for veterans and was trying to identify where to launch the program. Mr. Tschudi suggested the National Veterans Center as a location for the counseling services, which is located across from University Yard, and though unaffiliated with GW, has a close relationship with the university and its veteran community. In November, the Counseling Station opened at the National Veterans Center. The station, supervised by Mr. Tschudi, provides onsite certified counselors from the D.C. Veterans Center and the Wendt Center for veterans, military service members and their families. The station is funded by the United Way NCA and directed by the National Veterans Center staff. The Counseling Center Station also hosts weekly introductory meditation sessions for veterans and their families every Monday at 5 p.m. The free services are available to all local veterans. Mr. Tschudi emphasized that the new counseling services are not meant to be competitive with services offered by the University Counseling Center or other resources at GW. But rather, it is a cooperative effort between university staff and outside collaborators “to reach as many veterans and their families as possible,” Mr. Tschudi said. “I think it is important that we all work together, because as many entry points are available to the people who need services, the better off everybody is,” he added. Mr. Tschudi said figuring out the services that will be most effective for serving student veterans is always “a work in progress,” especially since the population of veterans on any college campus is constantly changing. Veterans, military service members and their families can schedule an appointment at the National Veterans Center Counseling Station by calling 202-480-2343. GW Steps Up Support For Military Students.